I have been a fan of the actor Denzel Washington for years. His performances in films such as Hurricane, Philadelphia and Malcolm X have been exceptional. I didn't know until recently that Washington is a professed Christian and feels that his faith is and should be a daily reality. Here's what I don't really understand. Actors such as Denzel Washington and Mel Gibson are willing to identify themselves as Christians yet they also participate in colossally violent film projects as well. I have mentioned before that Gibson's Passion of the Christ feels like Braveheart with a halo and some of his other films are filled with gratuitous violence. Washington has done the same, and now comes The Book of Eli. I haven't seen it, and I won't because I have caught the trailer at the theatre. It looks like a bleak, apocalyptic vision with lots of blood and gore. Why do these guys, both of whom have considerable acting chops, want to do these films? They seem so inconsistent with Christian values. I know that they are acting, and these are movies, not real life. Still, aren't there enough other actors and producers who can make the violent pictures? What is your opinion on this? Am I over-reacting or do you share my discomfort? I guess that I'm so desensitized to violence that I hadn't considering that particular incongruity. A good question you raise, David. There is a certain and obvious link between the artist and their work, although in film I'd argue that that link is probably at its most elastic. Denzel's film career has been such that for every role like those in "Hurricane" or "Philadelphia," there have been an equal number of roles he's "mailed in" for a pay cheque. Robert Deniro, Al Pacino and Sean Connery, among others have all done the same thing; in fact Connery once commented that he wouldn't be an actor if he weren't acting, thus he would take on the odd "League of Extraordinary Gentlemen" or "The Rock" just to make the mortgage. I guess the jury's still out, and in the meantime, dude's probably picked up $5 million for his trouble. If I were offered that much for a movie part, I'd probably concoct a moral justification with all of the flexibility of Mary Lou Retton, c. 1984! I chose not to watch the Passion of Christ for a lot of reasons. I have found that I no longer have any interest in watching anything connected to Mel Gibson. It wasn't a conscious choice, but seemed to drift into a concrete decision at some point. 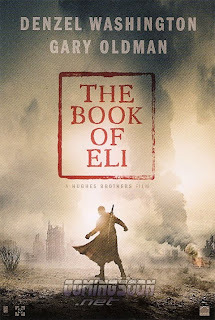 I wouldn't watch The Book of Eli regardless of who acts in it. It disturbs me that we flock to theatres to watch violence unfold. It seems so out of sink when placed side by side with what is happening in the world. I think our thirst needs to be quenched in other ways. In response to Ian, I have witnessed and experieced violence in my life and I did not become desensitized. In fact, I grew more aware of it's ever looming shadow and the impact of its depiction. I become ill when I see violence acted out. I have full blown anxiety attacks. We talk about desenstization and it puzzles me. The memory of real violence never leaves you. I think that's my problem with violent moveies. People who have lived through violnce tend to be less entertained by it. I react severely to violence of any kind, in any media. I have never read or seen a Stephen King book or movie, or 'Freddy' or 'Jason' or 'Halloween' or other generational or cult movie or author favorites. Violence scares the living daylights out of me and even reading of a violent scene in a book will haunt me and keep me awake for nights. I remember as a teen (late 1970's) reading a Reader's Digest story about the experiences of a prisoner of war and the nightmares I had for days afterwards. Over the years, there have been fewer and fewer movies and TV shows that I watch due to the show's gory and/or graphic nature whether it is a secular or religous film. (And sometimes that means turning the TV news off.) For me -no award winning movie, book, actor, or TV show is worth my peace of mind and/or spirit or sleep to be left with images so horrific. There are times when I am willing to watch violence in films because our world is violent. But I won't watch gratuitous violence in movies because it unsettles me, as it does two of you, and because I am aware of being desensitized, to use Ian's term. All three of you make important observations. What worries me is that we can engage in what has been called the myth of redemptive violence -- that violence solves violence, a regular theme in films.